Serving lobster tails to your dinner guests or loved ones is always a special treat, so you want them to taste great! Before buying frozen lobster tails for your next dinner party, you definitely need to know how to buy them. Saying this, be careful and buy the best product you can afford and buy from a reputable source. As frozen lobster tails usually come flash frozen, you need to know which ones are the best to buy. Most of the frozen lobster tails that you will find on the market come from a spiny clawless species of lobster, of which there are around 45 different species all over the world. 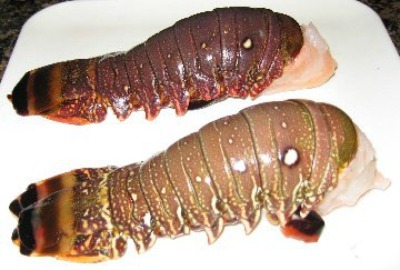 Warm-water lobster tails are mainly from Florida, the Caribbean, and Latin America. Warm-water lobster tails are not as reliable in quality as the cold-water lobster tails, as the meat can be mushy and not firm. There is nothing worse than spending your time and money to prepare a wonderful dinner and have one of the dishes not be up to par! Especially when you are spending the extra money to serve lobster tails. Another way to tell the difference is by looking at the shells. Caribbean warm-water tails have distinct yellow spots and a yellow band across the tail. Cold-water lobster tails generally come from Australia, New Zealand, and South Africa. It is harder to get frozen lobster tails from Maine as the lobster are more expensive and the tails usually have less meat. Look for the cold water ones, as they have whiter meat and are considered more tender because they grown more slowly in colder winters. Yes, the cold-water lobster tails will probably be more expensive, but why take a chance! There is a difference in taste and quality in these two types of frozen lobster tails. When buying frozen lobster tail, ask the fish provider if they are warm-water or cold water lobsters. If your fish provider does not know, just presume they are warm-water lobster and do not purchase. If you see any discoloration, like black spots, in the flesh of the lobster meat, do not purchase, as they were probably not handled properly. If the tail has a grayish color, it is a sign the lobster was not alive during the processing. Let the frozen lobster thaw in the refrigerator 24 hours before cooking. Cooking unthawed tails will result in tough meat. Lobster will thaw faster if placed in a plastic bag and immersed in water while in the refrigerator. If you a really in a rush to thaw the frozen lobster tails, you can use a microwave with a defrost setting to thaw the tails. Just be careful so that you do not start cooking the Lobster tails this way. After thawing, the lobster tails can be boiled, steamed, baked, broiled, or grilled. It is up to you. Cut the shell down the center of the back with scissors, leaving tail fan intact. Do not remove the under shell. I run my little finger between the meat and the shell to loosen from each other. 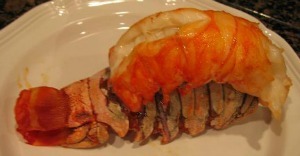 Lift uncooked tail through the slit to rest on the top of the shell (this is called a piggyback lobster tail). The outstanding lobster bisque recipe is from the 1965 cookbook A Treasury of Great Recipes by Mary and Vincent Price. This delicious soup is the result of cooking lobster meat in butter and then adding cream. Rich, delicious, and tasting of pure essence of lobster. The lobster meat shines in these wonderful hand-made lobster cakes. Can be served as an appetizer or an entree. Thanks for the tip. In the past I have always cooked lobster tails frozen. Just wondering if you should poach raw tails or should you cook slightly before butter poaching.